Heat 1 tbsp vegetable oil in a deep heavy-based non-stick frying pan and cook a finely sliced onion for 2-3 minutes, until just beginning to soften. Add 2 x packs 20 Waitrose Organic British Beef Meatballs and continue to cook over a medium heat for 8–10 minutes, turning frequently. Add a 700g jar Waitrose Arrabbiata Pasta Sauce With Tomato, Chilli And Garlic. 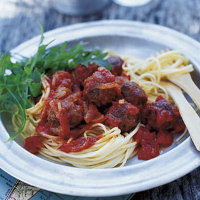 Bring to the boil and simmer for 3-5 minutes or until the meatballs are thoroughly cooked and there is no pink meat. Meanwhile, in a separate pan, cook 400g Waitrose Dried Linguine Pasta in boiling water until just cooked. Carefully drain the cooking water before serving the pasta with the tomato and meatball sauce, and a few roquette leaves.